This bride and groom who had their Marine wedding at Calamigos Ranch in Malibu wanted to display around 200 photographs in their Hand Crafted Elegant Wedding Album, but the Elegant Album caps at 85 photographs due to the thickness of each page. So, we proposed a three volume set of albums: Part 1 contains the Preparation and Ceremony photographs; Part 2 showcases their wedding Portraits; Part 3 has all of the fun wedding Reception photography. 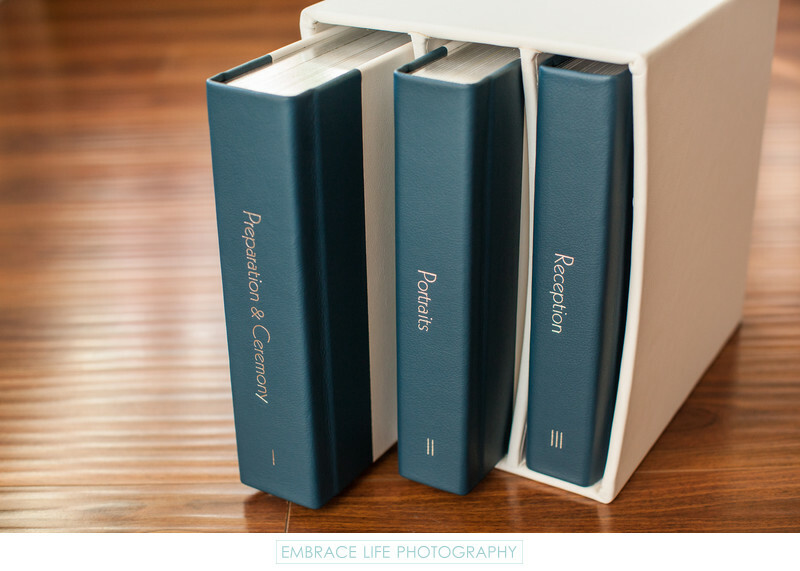 Inspired by the Marines dress blues uniforms, these wedding photo albums are styled in white leather on the front and back covers with navy blue leather spines, silver imprinting on the spines, silver page gilding, and a custom fit, white leather slipcase. Location: 327 Latigo Canyon Road, Malibu, CA 90265 USA.